The Dainese VR46 D2 Leather Jacket is the newest update to the very popular VR46 leather jacket. Everyone loves Rossi. You might not be as fast as him but at least you can look like him. Using that great Rossi yellow and that classic Dainese style, this jacket is sure to turn heads. The main difference between the new VR46 jacket and the old ones is the addition of larger S1 stretch panels on the back. This allows the jacket to be much more comfortable while still maintaining that race fit. This is a non-perforated jacket which means it will be perfect for this upcoming mid-season, fall riding. Composite protectors along with co-injected shoulders and Daineses fantastic tutu leather means that this jacket offers some of the best protection on the market. 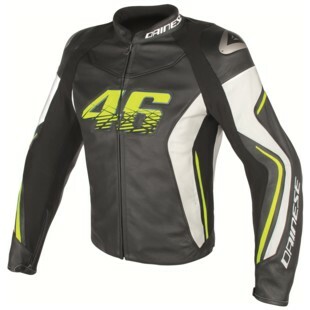 Overall the Dainese VR46 jacket is a great re-imagining of the classic Dainese leather jacket. It has all of the features that makes us love Dainese and has all of the style that makes us love Rossi. This is a fantastic jacket for any sport bike rider and will surely be a hit this fall.